The Climate Change, Alternate Energy & Water Resources Institute (CEWRI) of the Pakistan Agricultural Research Council (PARC) in collaboration with the International Centre for Integrated Mountain Development (ICIMOD) organized a training workshop on Earth observation applications in agriculture and food security at the National Agricultural Research Centre (NARC) campus in Islamabad, Pakistan from 26–28 December 2018. The workshop addressed the use of advanced satellite data analysis in agriculture. Topics at the workshop covered advances in optical remote sensing and use of microwave radar data to deliver information on crop health and assess drought-related crop failures early on. Hands-on exercises covered use of high resolution Sentinel data in combination with field based observation data in the Google Earth Engine (GEE) cloud computing platform. Capacity building of agriculture professionals in the use of new technologies is PARC’s priority area to keep research aligned with recent technological developments. Earth Observation (EO) technologies provide tremendous potential in supporting the implementation of long-term and large-scale research and development programmes in resolving data and information gaps in agriculture in developing countries. Earth observation technologies can provide information on the status of and changes in agricultural land use, agricultural productivity, and the resilience for food security. The three-day workshop brought together mid-career professionals comprising of researchers and PhD students from different institutions – Pakistan Meteorological Department (PMD), Pakistan Agriculture Research Council (PARC), Space and Upper Atmosphere Research Commission (SUPARCO), Provincial Agriculture Extension Department, Global Change Impact Studies Centre (GCISC), National Disaster Management Authority Pakistan (NDMA), Ministry of Climate Change, WWF-Pakistan, Lahore University of Management Sciences (LUMS), National University of Sciences and Technology NUST University, Arid Agriculture University, COMSATS, and Punjab University in Pakistan. Dr Rajesh Bahadur Thapa, Capacity building specialist at ICIMOD, appreciated the active participation of all trainees, and commended the efforts of the HI-AWARE team in Pakistan especially Dr Bashir Ahmad, Principal Scientific Officer/PI and Salar Saeed for putting in the groundwork towards materialization of the training and providing a platform for researchers in Pakistan to share their knowledge and learn about emerging Earth observation tools and technologies. 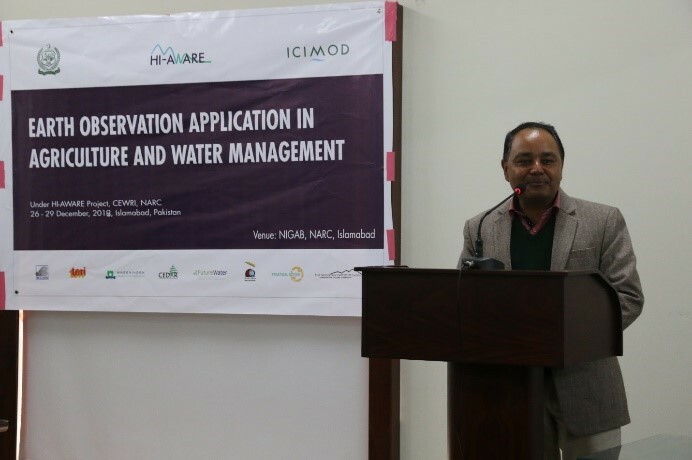 Dr Ahmad Kamal Nasir, a participant to the workshop from LUMS, appreciated ICIMOD’s efforts in organizing such trainings especially for early to mid-career researchers in areas like big data and cloud computing platforms and its usage for the agriculture sector. 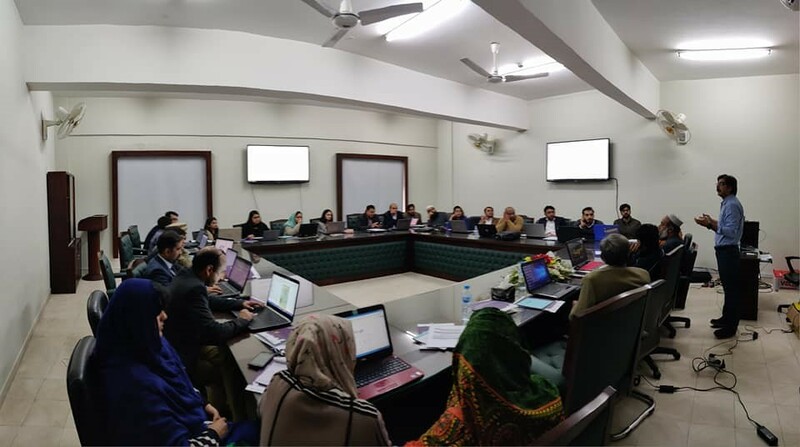 In his closing remarks, Dr Yusuf Zafar T.I, Chairman of PARC emphasized the need to keep young professionals up-to-date with global technological developments and making best use of sciences for agriculture and food security in Pakistan. He expressed satisfaction on the design and structure of the training, and added that the workshop must have advanced participants’ skills in the field of Earth observation technologies significantly. The training was organized under the HI-AWARE and SERVIR Hindu Kush Himalaya (SERVIR-HKH) initiatives at ICIMOD. SERVIR Hindu Kush Himalaya (SERVIR-HKH) is implemented by ICIMOD in its regional member countries, prioritizing activities in Afghanistan, Bangladesh, Myanmar, Nepal and Pakistan. SERVIR-HKH, an initiative under ICIMOD’s regional programme on Mountain Environment Regional Information System (MENRIS), caters to the specific needs of regional member countries in addressing different aspects of environmental degradation and climate change impacts. 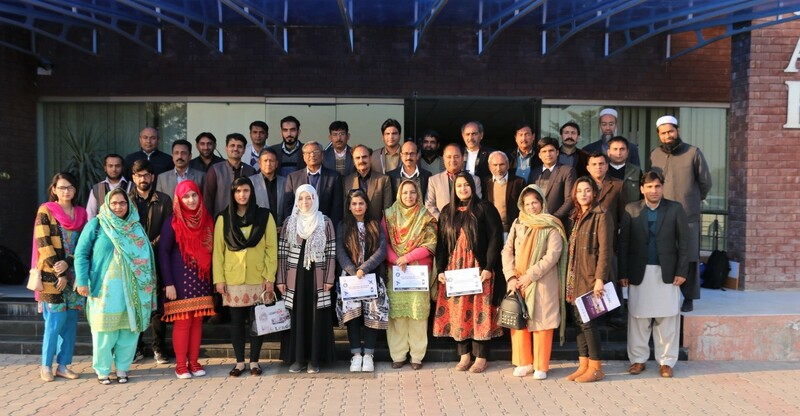 Dr Hammad Gilani, Assistant Professor-Space Science, with the Institute of Space Technology-Islamabad, and resource person to the training during the workshop. (Photo: Salar Saeed)ICIMOD has organized a number of trainings on the use of Earth Observation and Geospatial Information Technology (GIT), and the Google Earth Engine in particular, under its SERVIR-HKH initiative. HI-AWARE’s overall goal is to contribute to increasing the climate resilience and adaptive capacities of the poor and vulnerable women, men, and children living in river basins in South Asia. To achieve this, the project conducts research and pilot interventions, capacity building and policy engagement on climate resilience and adaptation to influence policies and practice that will improve livelihoods. HI-AWARE’s study sites are the mountains and flood plains of the Indus, Ganges, and Brahmaputra river basins in India, Bangladesh, Nepal, and Pakistan.